For other uses, see Audit (disambiguation). "Auditing" redirects here. For the Scientology practice, see Auditing (Scientology). An audit is a systematic and independent examination of books, accounts, statutory records, documents and vouchers of an organization to ascertain how far the financial statements as well as non-financial disclosures present a true and fair view of the concern. It also attempts to ensure that the books of accounts are properly maintained by the concern as required by law. Auditing has become such a ubiquitous phenomenon in the corporate and the public sector that academics started identifying an "Audit Society". The auditor perceives and recognises the propositions before them for examination, obtains evidence, evaluates the same and formulates an opinion on the basis of his judgement which is communicated through their audit report. Any subject matter may be audited. Audits provide third party assurance to various stakeholders that the subject matter is free from material misstatement. The term is most frequently applied to audits of the financial information relating to a legal person. Other areas which are commonly audited include: secretarial & compliance audit, internal controls, quality management, project management, water management, and energy conservation. As a result of an audit, stakeholders may effectively evaluate and improve the effectiveness of risk management, control, and the governance process over the subject matter. The word audit is derived from a Latin word "audire" which means "to hear". During the medieval times when manual book-keeping was prevalent, auditors in Britain used to hear the accounts read out for them and checked that the organisation's personnel were not negligent or fraudulent. An official examination and verification of accounts and records, especially of financial accounts, and a report or statement reflecting an audit; a final statement of account. An energy audit can suggest ways to reduce home fuel bills. An information technology audit, or information systems audit, is an examination of the management controls within an Information technology (IT) infrastructure. The evaluation of obtained evidence determines if the information systems are safeguarding assets, maintaining data integrity, and operating effectively to achieve the organization's goals or objectives. These reviews may be performed in conjunction with a financial statement audit, internal audit, or other form of attestation engagement. Due to strong incentives (including taxation, misselling and other forms of fraud) to misstate financial information, auditing has become a legal requirement for many entities who have the power to exploit financial information for personal gain. Traditionally, audits were mainly associated with gaining information about financial systems and the financial records of a company or a business. Financial audits are performed to ascertain the validity and reliability of information, as well as to provide an assessment of a system's internal control. As a result of this, a third party can express an opinion of the person / organisation / system (etc.) in question. The opinion given on financial statements will depends on the audit evidence obtained. In most nations, an audit must adhere to generally accepted standards established by governing bodies. These standards assure third parties or external users that they can rely upon the auditor's opinion on the fairness of financial statements, or other subjects on which the auditor expresses an opinion. In the US, audits of publicly traded companies are governed by rules laid down by the Public Company Accounting Oversight Board (PCAOB), which was established by Section 404 of the Sarbanes–Oxley Act of 2002. Such an audit is called an integrated audit, where auditors, in addition to an opinion on the financial statements, must also express an opinion on the effectiveness of a company's internal control over financial reporting, in accordance with PCAOB Auditing Standard No. 5. Cost auditor / Statutory Cost auditor is an independent firm engaged by the client subject to the Cost audit, to express an opinion on whether the company's Cost statements and Cost Sheet are free of material misstatements, whether due to fraud or error. For publicly traded companies, external auditors may also be required to express an opinion over the effectiveness of internal controls over Cost reporting. These are Specialised Persons called Cost Accountants in India & CMA globally either Cost & Management Accountants or Certified Management Accountants. Internal auditors are employed by the organisations they audit. They work for government agencies (federal, state and local); for publicly traded companies; and for non-profit companies across all industries. The internationally recognised standard setting body for the profession is the Institute of Internal Auditors - IIA (www.theiia.org). The IIA has defined internal auditing as follows: "Internal auditing is an independent, objective assurance and consulting activity designed to add value and improve an organisation's operations. It helps an organisation accomplish its objectives by bringing a systematic, disciplined approach to evaluate and improve the effectiveness of risk management, control, and governance processes". Thus professional internal auditors provide independent and objective audit and consulting services focused on evaluating whether the board of directors, shareholders, stakeholders, and corporate executives have reasonable assurance that the organization's governance, risk management, and control processes are designed adequately and function effectively. Internal audit professionals (Certified Internal Auditors - CIAs) are governed by the international professional standards and code of conduct of the Institute of Internal Auditors. While internal auditors are not independent of the companies that employ them, independence and objectivity are a cornerstone of the IIA professional standards; and are discussed at length in the standards and the supporting practice guides and practice advisories. Professional internal auditors are mandated by the IIA standards to be independent of the business activities they audit. This independence and objectivity are achieved through the organizational placement and reporting lines of the internal audit department. Internal auditors of publicly traded companies in the United States are required to report functionally to the board of directors directly, or a sub-committee of the board of directors (typically the audit committee), and not to management except for administrative purposes. 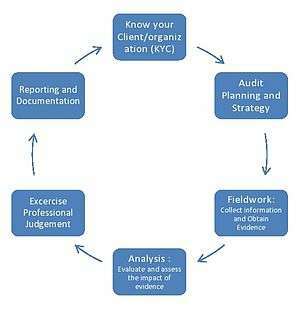 As described often in the professional literature for the practice of internal auditing (such as Internal Auditor, the journal of the IIA) -, or other similar and generally recognized frameworks for management control when evaluating an entity's governance and control practices; and apply COSO's "Enterprise Risk Management-Integrated Framework" or other similar and generally recognized frameworks for entity-wide risk management when evaluating an organization's entity-wide risk management practices. Professional internal auditors also use Control Self-Assessment (CSA) as an effective process for performing their work. Consultant auditors are external personnel contracted by the firm to perform an audit following the firm's auditing standards. This differs from the external auditor, who follows their own auditing standards. The level of independence is therefore somewhere between the internal auditor and the external auditor. The consultant auditor may work independently, or as part of the audit team that includes internal auditors. Consultant auditors are used when the firm lacks sufficient expertise to audit certain areas, or simply for staff augmentation when staff are not available. Safety, security, information systems performance, and environmental concerns are increasingly the subject of audits. There are now audit professionals who specialize in security audits and information systems audits. With nonprofit organisations and government agencies, there has been an increasing need for performance audits, examining their success in satisfying mission objectives. To benefit the organisation, quality auditing should not only report non-conformance and corrective actions but also highlight areas of good practice and provide evidence of conformance. In this way, other departments may share information and amend their working practices as a result, also enhancing continual improvement. Regulatory Audits: The aim of a regulatory audit is to verify that a project is compliant with regulations and standards. Best practices of NEMEA Compliance Centre describe that, the regulatory audit must be accurate, objective, and independent while providing oversight and assurance to the organisation. Formal: Applies when the project is in trouble, sponsor agrees that the audit is needed, sensitivities are high ,and need to be able prove conclusions via sustainable evidence. Informal: Apply when a new project manager is provided, there is no indication the projects in trouble and there is a need to report whether the project is as opposed to where its supposed to Informal audits can apply the same criteria as formal audit but there is no need for such a in depth report or formal report. ↑ Power, Michael. 1999. The Audit Society: Rituals of Verification. Oxford: Oxford University Press. ↑ "Evolution of auditing" (PDF). David Publishing. ↑ Derek Matthews, History of Auditing. The changing audit process from the 19th century till date. Routledge-Taylor & Francis Group. p. 6. ↑ McKenna, Francine. "Auditors and Audit Reports: Is The Firm's "John Hancock" Enough?". Forbes. Retrieved 22 July 2011. ↑ "CONCEPT RELEASE ON POSSIBLE REVISIONS TO PCAOB STANDARDS RELATED TO REPORTS ON AUDITED FINANCIAL STATEMENTS" (PDF). Retrieved 22 July 2011. ↑ "Auditing Standard No. 5". pcaobus.org. Retrieved 2016-06-28. ↑ Ladda, R.L. Basic Concepts Of Accounting. Solapur: Laxmi Book Publication. p. 58. ISBN 978-1-312-16130-6. ↑ "Pages - Definition of Internal Auditing". Na.theiia.org. 2000-01-01. Retrieved 2013-09-02. ↑ "Pages - International Professional Practices Framework (IPPF)". Na.theiia.org. 2000-01-01. Retrieved 2013-09-02. ↑ "Professional internal auditors, in carrying out their responsibilities, apply COSO's Integrated Framework-Internal Control". Theiia.org. 1 2 Different Types of Audits (June 2013) Auditronix Guidance Note Archived July 18, 2013, at the Wayback Machine. ↑ Gilbert W. Joseph and Terry J. Engle (December 2005). "The Use of Control Self-Assessment by Independent Auditors". The CPA Journal. Retrieved 10 March 2012. Amat, O. (2008). Earnings management and audit adjustments: An empirical study of IBEX 35 constituents. Available at SSRN 1374232.